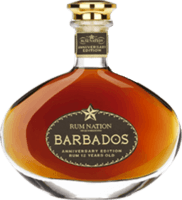 Have you found an online vendor selling Rum Nation Barbados 10-Year 2001? Tried the Rum Nation Barbados 10y 2001 edition on a rainy day. Hard to find bottle, semi dark color, a bit harsh on the nose, but still shows nice aged rum flavors. Quite dry rum. I think this rum would be very good if it would contain a bit more sweetness. The flavors are definitely there, but a tad too dry for my liking. All I know is I have had it and I didn't hate it. Must search my cabinets and see if I still have any left and give you a better opinion on this rum. ...to sip: sweet and tasty. Close (of course) to the "Plantation Barbados" serie. But the price is a wee bit too high. 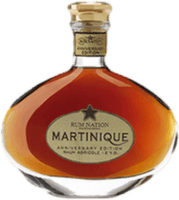 Quite in the same price range, I could get the similar "Plantation Barbados XO 20th Anniversary": Rum Nation is a little bit harsher, Plantation is a little bit sweeter. Tørrede frugter i duften. Figen, daddel, rosin. Går igen i smagen, blød, runder af i noter af urter (mynte, lavendel, timian!) og chokolade. Ikke nogen stor eller fyldig smag, måske lidt for afdæmpet.